Developed by an Inter-Governmental Partnership as an extension of Stormwater Planning: A Guidebook for British Columbia, the “Water Balance Model powered by QUALHYMO” is the shared legacy of a team of senior practitioners. “The tool is the outcome of a building block process that has depended on the commitment of a number of organizations, and especially the efforts of the champions within those organizations, to produce a series of deliverables that successively advanced the practice of rainwater management within British Columbia,” states Ted van der Gulik, Partnership Chair. A decade ago, the genesis for WBM development was UniverCity, the sustainable community built adjacent to Simon Fraser University atop Burnaby Mountain in Metro Vancouver. 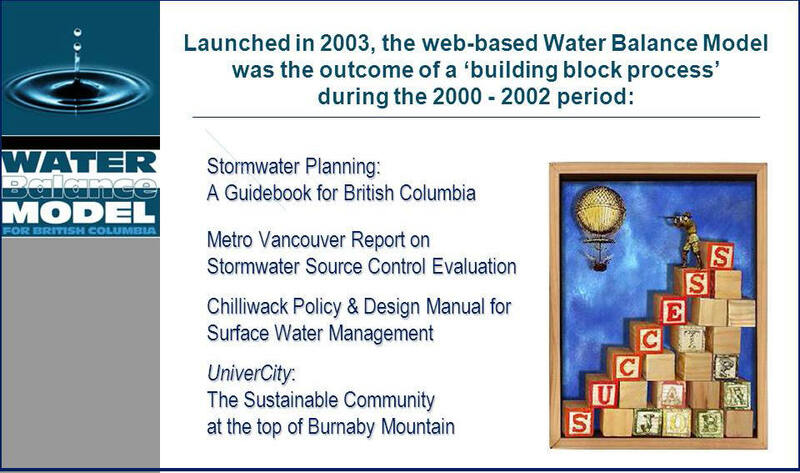 The value of the water balance approach was then recognized and championed by a Metro Vancouver technical committee. In 2007, the Water Balance Model web interface was integrated with the QUALHYMO calculation engine. This provided the capability to address the interaction of runoff (volume and duration) with the physical aspects considered important to the aquatic environment. To read the complete story posted on the Water Balance Model website, click on Water Balance Model powered by QUALHYMO: A Team Effort.